Lady bar by night, amazing American breakfast by morning. 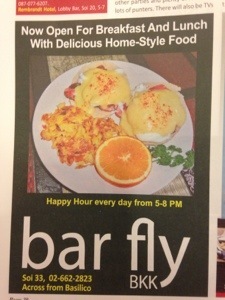 I had read about breakfast at barfly in the Sukhumvit magazine and what they had to offer looked amazing. I had remember seeing the bar as I walk down Soi 33, a soi known for its lady bars where you can buy a lovely lady that works at the bar a drink and negotiate a price for further entertainment as the night goes on. I was a little put off thinking about having breakfast there but at the same time the picture of the Eggs Benedict in the magazine was calling my name. We arrived to the bar at 8:30am, they open at 7am everyday for breakfast, at first all you smell is cigarettes like a wet ashtray. Again I’m a little put off… After a few minutes the smell, I’m sure is still there, we get used to it. 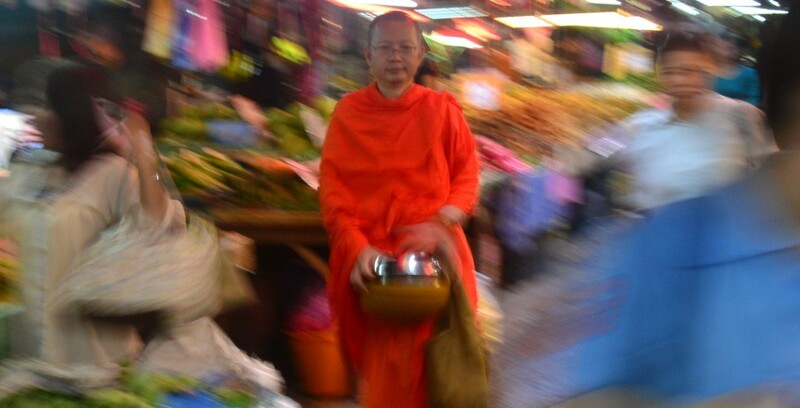 We are greeted by a sweet smiling Thai lady who is our waitress and chef for the morning. She starts our breakfast with coffee. The coffee is weak but that’s okay because I had coffee at home already and I’m super picky about my coffee (Christopher created that monster and now I’m a little bit of a snob). I order an Eggs Benedict that comes with hash browns and Chris ordered a Denver omelette. Was the food good you ask? Let’s just put it this way, I have no pictures of the food because it was so delicious we literally inhaled it, swooning (okay I was totally swooning, Chris doesn’t swoon) as I ate the entire plate. This was probably the best Eggs Benedict I have ever had; the eggs were poached to perfection, the hollandaise sauce was creamy and rich and the hash browns had a crunch and a flavor to them like no hash browns I have ever eaten. This chef takes such pride in her work and it shows. The only complaint at the time was how long it took to get the food since we were the only ones in the restaurant but then we realized she was cooking all by herself and had to prep everything and dice the vegetables for Chris’s omelette as everything was made and prepared fresh! As soon as we realized that we no longer had a complaint! I will gladly wait 30 minutes to eat there again for breakfast. huge, fancy buffets on the weekends at the big hotels and make a stop off of Phrom Pong and enjoy a real America breakfast! I fully recommend breakfast at barfly and will be going back for more, shoot if I had my way I would eat there every weekend! I can’t wait to try the pancakes next! 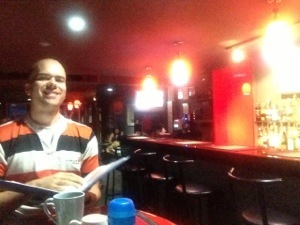 This entry was posted in Life In Bangkok and tagged Bangkok, Barfly, breakfast, Expat, soi 33, Thailand. Bookmark the permalink. Becky about the coffee blame John he started it all. I’m never really hungry, but just reading about the breakfast that you and Chris had my mouth is watering. Kara made second place this weekend. The drive back home was pure HELL, the rain so hard I could not see in front me. Have a Great week . We send ton of love and prays.